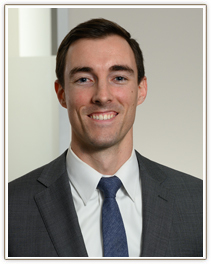 Mr. Schoenherr joined Curran Moher Weis after practicing for a general practice firm in Fairfax, Virginia. At his prior firm, Mr. Schoenherr handled a wide variety of cases but found a particular affinity for family law. He now focuses entirely on family law matters such as divorce, custody and visitation, spousal and child support, equitable distribution, and other post-divorce modification and enforcement issues. Mr. Schoenherr is originally from Connecticut. He received his undergraduate degree from James Madison University and went on to receive his law degree from the University of Connecticut. At UConn, Mr. Schoenherr was editor in chief of the Public Interest Law Journal, vice president of the Mock Trial Society, and elected to the Moot Court Board. Mr. Schoenherr works to protect his clients and their rights and strives to be a calming and stabilizing influence on his clients. Mr. Schoenherr is an active member of both the Fairfax Bar Association and Virginia Bar Association, participating in bar events including the Fairfax Young Lawyers Softball Team. He has also dedicated much of his time in practice to assisting children and indigent adults as a court appointed attorney and guardian ad litem in both the General District Court and Juvenile and Domestic Relations Court.